As Memorial Day weekend approaches, I'm getting very excited to spend time in Annapolis with friends and family! On Easter weekend, Brian decided that it would be a fun if we got a puppy (cue: Hallelujah Chorus). I was over-the-top excited and would have gone right then to get a dog, but buying a puppy is not a snap decision. There was a lot we needed to discuss. Which breed? Animal shelter vs Breeder? High Energy vs Low Energy? Big vs Small? Will a dog fit in with our lifestyle? Brian had mentioned a French Bulldog, so I was thrilled. French Bulldogs are awesome! So I started looking into French Bulldogs. 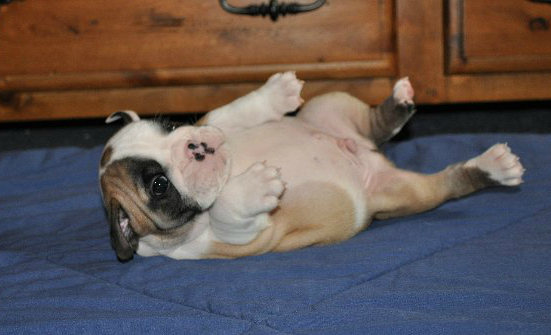 So I started looking into English Bulldogs. 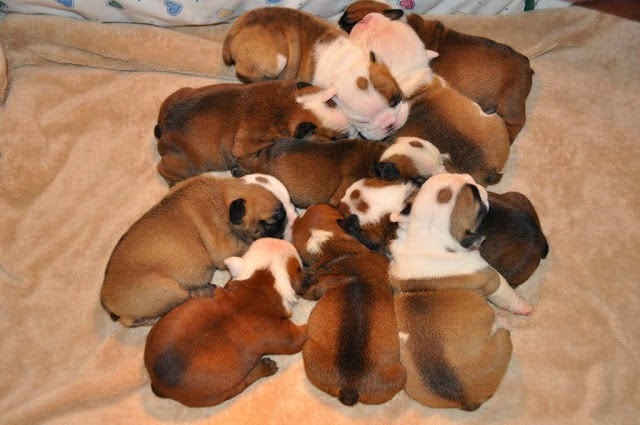 We found a breeder with a brand new litter of English Bulldog pups, and it seemed perfect that we could bring home the puppy in eight weeks. I saw the first picture of the puppies and I was the happiest person in the world! Fast forward a few weeks. Brian decided he wanted a boy dog. We decided we would name the dog Sam. We finally were able to go to the breeder's house and select which puppy we would be getting. I immediately fell in love with one particular puppy. In my head, he was our Sam. In my heart, he was already mine. Also known as "Sam the Brute." Sam puts the bull in bulldog. After about 30 minutes of being outside with Sam, he became adorably bad. He would knock himself full-force into the other brothers and bite their ears. Sam was a force to be reckoned with, but of course I still wanted to take him home. I had already claimed him as my OWN CHILD. Brian, however, had another favorite. This was a battle I didn't win. Not Sam is the dog we will be bringing home, which isn't an easy thing for me to accept. Not Sam is well-behaved and laid-back. He is cute, of course, but he did not feel like mine. I am currently suffering from postpartum puppy depression. When I look at pictures of Not Sam, all I'm thinking is "This doesn't feel right"...."Why am I no longer excited?"... "Am I ever going to warm up to this little guy?" I think I will overcome my disappointment once we actually bring home Not Sam. 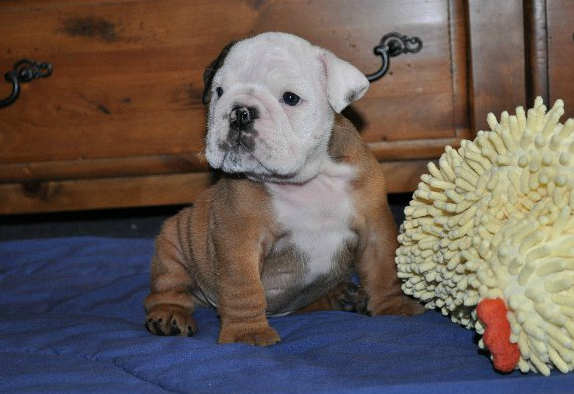 Once he has an actual name and once he is officially ours, I'm sure I will fall in love. But for now, I miss the idea of Sam. Brian has stomped on my dreams and he has flushed my heart down the toilet. As a peace offering, Brian has said that I can choose the puppy's name (since we are no longer naming the dog Sam). Please take a moment to think of the world's WORST dog name and add a comment below. Mortimer. It's fitting because, if he's as calm as you claim, he must be an old man, not a puppy. You can call him Morti and take him for bagels with lox on Sundays while sitting in the park :)!